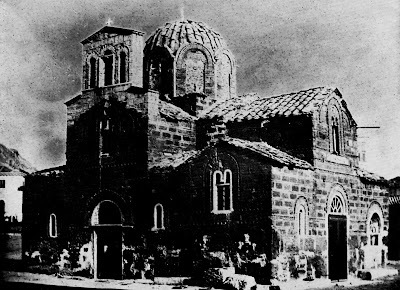 Agioi Theodoroi is an 11th century distyle cross-in-square church. According to an inscription above the western entrance it was founded in 1049 or 1065 by one Nikolaos Kalomalos, a Byzantine official of the town who had the office of Spatharocandidatos or imperial bodyguard. It was built on the foundations of an older church, whose proportions influenced the present one; its three apses are unusually prominent, probably following the lines of a more massive predecessor. 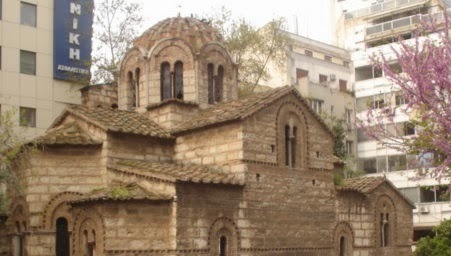 It is typical of other churches built in the city’s Golden Age of Byzantine art. For reasons I am not sure, it is not my favourite although it has all of the hallmarks of the architecture of that era, the slim Athenian dome, the cloisonné exterior masonry with bands of ornamental brickwork, marble lintels, relief decorations and kufic lettering running around the north, west, and south sides. Possibly it is the location on such a busy square. Its exterior shows the signs of Athens’ smog and the air conditioners stuck on the brickwork of the apse are somewhat jarring. The interior is almost exotically elaborate, much of it reflecting 19th century tastes. The tulip or chalice shaped pulpit is particularly ornate and, although by no means unique to this church, it looks very much like it belongs with marble iconostasis and all that silver casing in the background. The dove on its lectern looks ready to take off at a moment’s notice. 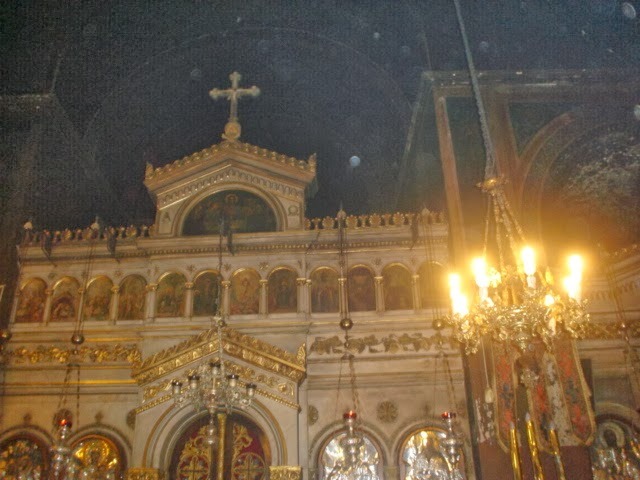 The cross high up on top of the iconostasis is placed over a skull and crossbones, an odd symbol unless you know it is a symbol of Christ’s promised resurrection after death caused by the original sin! 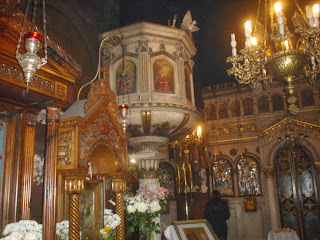 The frescoes are 20th century by Athanasius Kandris. 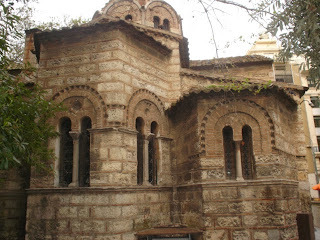 You can visit and see what you think and the plus here is that this is one of Athens’ Byzantine churches that is open daily. Many locals from nearby offices visit to light candles. There is a very pleasant lady whose task it is to whisk away the candles the moment you light them, a phenomenon I have noticed before and find quite disconcerting. I am never sure if the candle has done its work before it is off to be recycled. The modern bell-tower incorporates fragments of the marble iconostasis of the older church in its brickwork.